This isn't a restaurant, but an old food-related business, no longer in operation. It's in full view from car or bus on a major Chicago street. Guess the business and its location. I thought this might be a tough one. Let me give some geographical clues (clues about the business will follow if necessary). Here's a shot of the entire building, located in the southwest quadrant of the city. This is exactly how it would appear to a driver heading west on a major Chicago thoroughfare. The building itself is on a side street, just north of the intersection. Is this the LaGrou warehouse on Western? Is it the Best's Kosher place down on....35th or thereabouts? stevez wrote: Is this the LaGrou warehouse on Western? Not LaGrou. I think it was used as a warehouse at one time (and may still be) but that was not its original purpose when it was built in 1907. Octarine wrote: Is it the Best's Kosher place down on....35th or thereabouts? Not Best, on 39th/Pershing immediately north of the old stock yards. This building is over two miles from The Yards. When this building was finished in 1907 over 50 such businesses operated in the city. Seventy-five years later none were left in Chicago. Rene G wrote: When this building was finished in 1907 over 50 such businesses operated in the city. Seventy-five years later none were left in Chicago. I would say the Armour and Co. meatpacking building, or some other meatpackers, but Chiapetti remained in the city long after 1982. Spaulding north of Cermak. An old brewery. Amata wrote: Spaulding north of Cermak. An old brewery. Very good! That's the old Mutual Brewing Company, once owned by Prohibition-era beer baron Terry Druggan. Check out this web site where I found the above photo. The coming soon sign announces "West Oak" - the listed number is for an auto dealership, making me think the sign is for the lot rather than the building, which is sad in a way. The reverse-angle postcard is a great find, especially with the broad avenue on the north side. I wonder how (and when) the train tracks fit in. * Thanks for the thought-provoking entry, Rene. Constructed in 1907, the Mutual brewery has survived relatively intact. Located on Spaulding just north of Cermak, this small brewery remained in operation until 1924.4 Indeed, brewing continued five years into Prohibition as a 1923 Sanborn fire insurance map confirms. The architecture of the brewery is quite simple compared to others in the city. The tall main building contained the brewing and packing operations. Also still standing along Cermak (not shown) is a small structure that housed offices and storage. The rear of the building is angled because it was originally served by a railroad siding. Since closing as a brewery in 1924, the building has been used by a variety of other operations. For example, a 1950 Sanborn fire insurance map shows it in use as a warehouse. No railroad in the postcard, so either that's an idealized view, or the above information is inaccurate. Peter - I agree that this was a great, thought-provoking Guess the Restaurant. More, please! 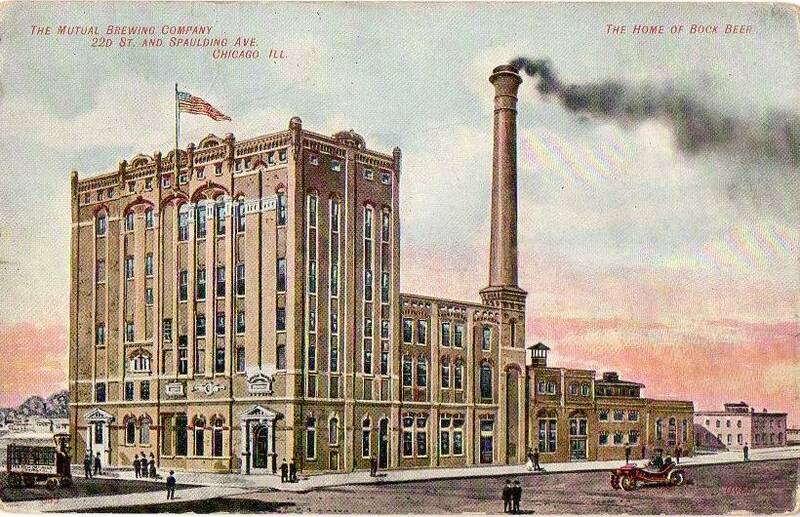 Here is a link to a thread I created a while back about brewing in Chicago around 1900 (7 years before this building was built). There are some interesting facts about the brewing industry in Chicago. For instance, in 1900 there were 5000 chicagoans working in the brewing industry and Charles Wacker (of drive fame) was a brewer. I have always intended to drive around to find out if any of the buildings in my post are still standing (I know at least one is). Many of the locations listed are using old street names, which means searching old maps (online) from the historical society. The train tracks fit in very closely, leaving no room for a broad avenue. I don't think there was ever an official street between Cermak (then 22nd Street) and the tracks. Detailed maps from 1873, 1903 and 1910 give absolutely no indication there was a street between the tracks and 22nd. There may well have been a short private road immediately north of the brewery but it could hardly have looked like the one on the postcard. This shot, looking northwest (from the northeast corner of the building) gives an idea how close the tracks are to the building. The tracks angle southwest so they only get closer toward the back of the brewery. Most of that information is accurate as far as I know, though I think it might have continued as a brewery after 1924 (why, that sort of thing never happened during Prohibition in Chicago, did it?). The railroad, known as the Chicago, Burlington and Quincy Railroad when the brewery was built, was in the same position in 1873 (and earlier) as it is today. These days it's known as the BNSF (Burlington Northern Santa Fe). I imagine you can see the old Mutual Brewery while whizzing by on the Metra to Naperville. Here's a shot of the north side of the building. The lower 3 story section, back to the smokestack, corresponds well to the postcard view. You can even see what's left of the smokestack's base. But beyond (ie, west of) the smokestack the postcard view doesn't fit with the current building, which angles south (likely because the train tracks do too) and is difficult to see from the street. I would suggest the section beyond the smokestack isn't faithfully portrayed on the postcard. That little pink building at the right is probably pure fantasy. I think that's where the tracks are now and have been for over a century. Not long ago I attended a lecture by Susan Appel, professor at Illinois State University and the authority on pre-prohibition brewery architecture in the Midwest. She mentioned that artist's renderings of these buildings are often not accurate. I suspect this is yet another example. Mutual Brewing is not the only interesting commercial structure on that block of Spaulding. Directly across the street is Lawndale Forge, an industrial blacksmith still in operation. I don't know how far back this building goes but there has been a blacksmith at this site since before the Great Fire of 1871.
d4v3 wrote: I have always intended to drive around to find out if any of the buildings in my post are still standing (I know at least one is). Many of the locations listed are using old street names, which means searching old maps (online) from the historical society. I have a feeling that pieces of Brand Brewery on Elston are all that remain of the group mentioned in that beautiful 1900 review. But if you find, say, a fragment of the Cooke or Keeley Brewery you'll be an instant hero among the Chicago breweriana crowd. People have looked but there may be a surprise or two waiting for a trained searcher. Update on the Brand Brewery complex on Elston Avenue. Save the Brewery event for Nov 21 is sold out. Cathy2 wrote: Update on the Brand Brewery complex on Elston Avenue. I passed the Brewery on Wednesday afternoon, it was more than half demolished.